We regularly receive questions from our clients, either by phone or via our Facebook page, asking about issues relating to their pet. However, every now and again we get asked general questions just because people are interested in knowing the answer. We thought we would write a blog about this very popular question. So, why do dogs eat grass? The honest answer is we don’t know. No one really knows, but there are various theories. The most popular theory is to make themselves sick. If a dog feels ill, they may ask to be let out and munch on the nearest patch of grass they can find. As the grass goes down it tickles their throat and makes them vomit. 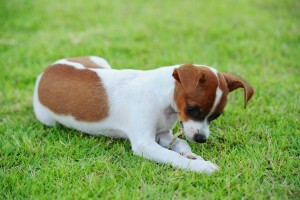 Also, dogs may find temporary relief from eating grass if they have an upset stomach or are a bit gassy. This sort of behaviour doesn’t happen often so if your dog starts eating more grass than a Jersey Cow and vomit on a regular basis it might be worth you taking a trip to the vets to make sure there isn’t an underlying issue. Some people believe that dogs will eat grass because they are trying to improve their own digestion. It could be they are lacking fibre in their diet and are trying to add more. If you think your dog is lacking in fibre you could give them supplements or change their food. If you plan on doing this, you should speak to your vet beforehand so they can recommend the best food/supplements and make sure there are no other issues. Dogs might eat grass because they are bored or are seeking attention. If this is the case take them for regular walks or play with them more often to see if the grass eating stops. If they are stuck in the back garden with nothing to do, then they might turn to chewing the cud just for something to do. 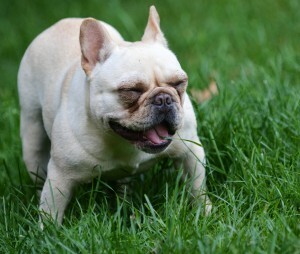 It could be down to the fact your dog loves the taste and texture of grass. When I was young my dog would eat grass regularly. Not just any old grass either. He would find the greenest and thickest patches of grass and just eat and enjoy it like he was at a free salad bar. At the time he was checked out and no issues were found. It’s just something he did and didn’t cause him any harm. Overall it’s not dangerous for your dog to eat grass. Whilst it might not do them much good in terms or nutrition it won’t do them any harm either. However, one thing to point out is that gardens nowadays may have been sprayed with weed killer or other pesticides. In large quantities it can be dangerous to animals so keep that in mind. 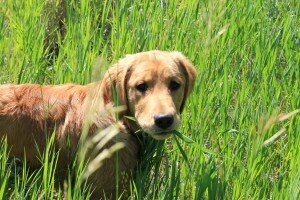 If you notice your dog is eating unusual amounts of grass and you are concerned take them to your vet for a check-up. It might be nothing serious but it’s always best to check.